Phoenix Petroleum Philippines partners with the National Basketball Association (NBA) to give Phoenix customers collectible NBA Playoffs car sunshades with the “Phoenix Fastbreak to Summer Promo”. Basketball fans will get a chance to collect eight limited edition car sunshades featuring NBA Western and Eastern Conference Teams: San Antonio Spurs, Los Angeles Lakers, Houston Rockets, Oklahoma City Thunder (OKC), Indiana Pacers, Miami Heat, New York Knicks, and Chicago Bulls. Every Phoenix fuel purchase worth P1,000 single or accumulated receipt entitles customers to purchase NBA Playoffs car sunshade for only P200. 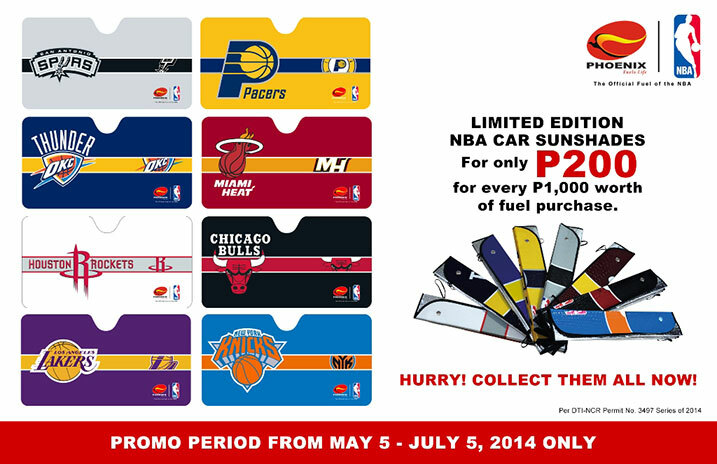 Promo runs in participating Phoenix stations nationwide from May 5 to July 5, 2014.